→Are There Any Health Benefits From Woodworking? What are the Health Benefits of Woodworking? Is woodworking good for you? Woodworking has been in existence for ages when materials are still scarce and limited in making furniture, fixtures, houses and other equipment. Even little DIY projects require simple woodworking techniques and skills that many are now engaging and enjoying to do. But whether it is a professional job, an interest, or a hobby, are there any health benefits from woodworking? While it is something you probably love doing, it would make even more sense to know if it has some positive effects to your health too. For many who will look at it, it is a job and a routine that you have to show up, work until one project is finished then moves to the next and so on. Its goal is to finish one task at a time. While we see only that side of the coin, professional woodworkers, hobbyist and enthusiasts, however, see it differently. Like pursuing music, fashion, art or wanting to spend the rest of your life traveling and writing about it, woodworking is also like those kinds of passion projects or jobs. Hence, it is not unlikely that you will know one who will wake up at the wee hours of the night and finds them cutting or hammering some wood and creating and building something random or something they have pictured on their head and was too excited to give it a start. Whether they are paid or not, they will be happy to do it, not for others but for themselves. Where ever you look, you will see some good pieces of wooden furniture, fixtures, buildings, or anything that has woodworking stamp all over it. The sky is the limit, because for woodworkers, they can basically create anything small to something huge and extensive and even turns something old and used into one piece of art, décor or usable things and projects. Through the years, woodworking has evolved from the use by hands and simple tool to more high end, sophisticated and advanced machines and power tools that are widely used today. Several schools also offer courses and studies about different specialization of the craft because there are myriad of opportunities that go with it. While you can be employed in a furniture and construction companies, with your skill, you can freelance and put up your own business and even work for home as well. Woodworking is about building and creating things. And with that, it is not only demanding physical woodworking skills but your creative mind to be working overtime, throwing in some artistic project ideas, crafting and constructing unique designs and a lot of strategizing and planning. In fact, in one article published by CBS News, woodworking is included on the list of the creative hobbies that could keep your mind sharp and alert even as you age. This is backed by several studies that show these creative exercises reduce the risk of dementia and other cognitive impairment along with other artistic hobbies and crafts such as painting, quilting and pottery among others. It is also called as the “whole-brain activity”, as by doing such activity allows the function of both your right and left brain as you are using your logical part when doing the calculations and measurements and at the same time your creative sensor for coming up with brilliant and unique ideas when doing a project. This creativity is scientifically proven to be useful also when dealing with everyday situations and challenges. It has been an effective channel for those who are coping from traumatic brain injuries, anxiety, chronic pain, depression and other mental illness. One way to avoid and manage stress is getting into a hobby and doing something that makes you happy and gets you busy. And one of those is to try to do some woodworking activities, if you are not yet involved in it. A creative outlet, it makes your mind work and imagination active that it helps you clear it from any negativity and thinking of problems and other stressful activities. It is even considered to be a fulfilling hobby or interest having to build something from scratch and getting the validation from people who appreciates your work. 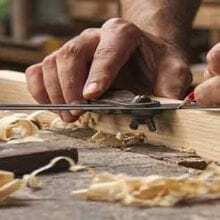 Furthermore, some of the reasons why many are taking up carpentry and woodworking courses has a lot to do with the physical, mental and emotional benefits, aside from the business and career opportunities that goes with it. Since it requires your attention to details especially on precise measurements and wood cuts, it develops your focus and keeps your mind to concentrate on the task alone. The physical activities of woodworking especially when completing huge projects enhances strength, endurance, body control and hand dexterity. And with all these exercises, it makes your body become fit to carry on heavy duty and sometimes complex projects. Many people are starting to get interested in woodworking professionally or as a hobby not only for career and business opportunities but also because it is proven to be beneficial physically, emotionally and mentally. A lot of this has to do with the creativity aspect of having to create and build things and turning pieces of wood into fine and useful finish products. The positivity and happiness it brings is also helpful for those dealing with stress and anxieties. Do you have any questions in mind about these health benefits of woodworking? Ask away and comment it below. We’ll be glad to answer it for you.